In this practical book, Jonathan Malm examines 50 ways churches make first-time visitors feel unwelcome. The transgressions range from insider lingo to awkward transitions, a cold congregation to the over-eager greeter. Let’s get started in church communication. 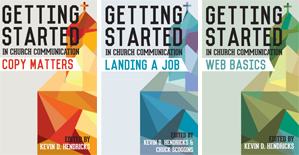 This new series covers writing, websites and landing a job, three volumes available separately or collected in one handy ebook. Each volume is full of practical tips and expert insights, a how-to guide that can get beginners going and help inspire and refresh the pros.